We have only one quibble with this crazy easy chocolate fudge recipe. Although the author mentions in the cookbook that this is “certainly not your grandma’s classic chocolate fudge, ” we find that to be not exactly true. The author, of course, who couldn’t be lovelier or more creative (have you tried her chocolate-dipped potato chips?! ), is referring to the classic turn-of-the-20th-century fudge that needed to be beaten within an inch of its life. This recipe is not that. But this recipe is the very same easy chocolate fudge recipe making the rounds in spiral-bound church cookbooks in the Midwest and, we suspect, elsewhere for literally decades. It’s the fudge that our editor in chief recalls from childhood and the one that the grandma in her family still makes. Whether the recipe has remained in circulation so long because it’s so darn good or because it’s so shamefully easy to make isn’t clear. We suspect it’s probably due to both. 1. Line an 8-inch (20-centimeter) square baking pan with aluminum foil, leaving ample overhang on all sides. 2. Combine the condensed milk and chocolate chips in a medium-size saucepan over medium heat. Stir constantly with a rubber spatula or wooden spoon as the chocolate chips melt. Once the mixture is smooth and the chocolate chips have melted, remove pan from the heat. The mixture will be extremely thick at this point. Stir in the vanilla extract and walnuts until combined. Pour the thick mixture into the prepared pan and smooth into an even layer. 4. Once the fudge has set, remove it from the pan by lifting out the aluminum foil using the overhang on the sides of the pan. Invert the slab of fudge onto a cutting board, peel away the foil, and flip the fudge back over. 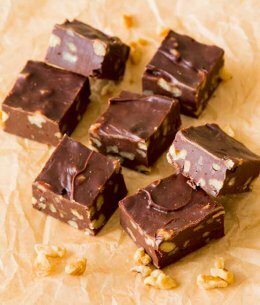 Using a large sharp knife, slice the fudge into 1-inch (2 1/2-centimeter) squares. If the fudge has been in the refrigerator for longer than 4 hours, it might be quite stiff, so allow to sit at room temperature for 20 minutes or so before cutting. It goes without saying that this makes a spectacular gift for any occasion. 16.3 Oz. Excellent Taste. Made of ONLY 6 of the highest purity ingredients. CERTIFIED USDA ORGANIC and FAIR TRADE ingredients. Contains 14g of protein per serving ( to support lean body mass and healthy body. Highly digestible. Excellent source of protein. Panuche or Panocha is a fudge like confection. It consists of brown sugar and whole milk or light cream mixed and boiled to the soft-ball stage. It is then cooled and nuts, dried fruit or marshmallows are mixed in and spread in a flat pan. One variation substitutes strong coffee for the milk or cream.